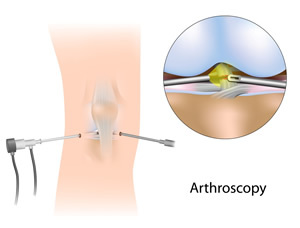 Arthroscopic surgery is a leading technique used to investigate, diagnose and treat problems inside a joint. At Orthopaedic Associates of St. Augustine we have a team of orthopaedic specialists experienced in performing arthroscopic surgery on every joint in the body. Arthroscopy was first used to diagnose problems of the knee joint, but the invention of smaller surgical instruments enabled arthroscopy to be applied for the treatment of several knee conditions. As a result of high success rates, surgeons were quickly encouraged to use arthroscopic surgery on other joints in the body. Today the technique is one of the most preferred treatment approaches for joint problems of the foot, ankle, knee, hip, wrist, elbow, and shoulder. Traditional surgeries often require large incisions and excessive damage to a joint’s surrounding tissue, but with arthroscopic surgery only a few small incisions are needed for diagnosis and treatment. By inserting a fiber optic instrument (camera) through a small incision, surgeons are able to see the joint up close without invasive investigative surgery. The camera offers a magnified view of the joint, including the bones, cartilage and ligaments. Perhaps one of the biggest benefits of arthroscopic surgery is that it significantly decreases a patient’s recovery time. The incisions are only a few millimeters long and procedures are completed with such precision that very little body trauma is experienced. Naturally patients who undergo arthroscopic surgery tend to have less pain, bruising and swelling than those who receive other types of surgery. Arthroscopic surgery may be an option for you whether your joint pain is caused by a sudden sports injury or natural wear and tear. The team at Orthopaedic Associates of St. Augustine has been helping patients in the Jacksonville, St. Augustine, St. Johns, and Palm Coast areas for years and we would love an opportunity to be a part of your joint treatment and recovery process. Please request an appointment online or call 904-825-0540 to schedule with one of our leading orthopaedic specialists.